NEW ORLEANS – It’s beginning to look a lot like the indoor season we have come to love. Athletes are picking up the pace on the track and hitting huge marks in the field. 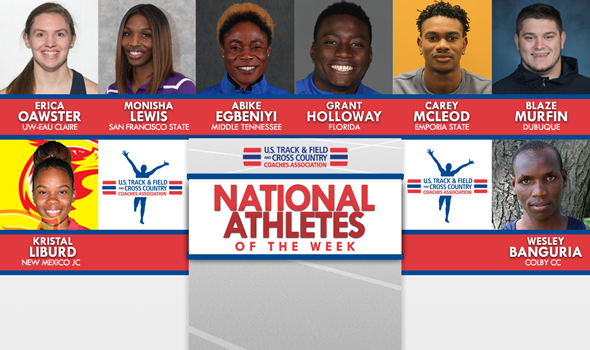 Here are eight of those athletes who stood out from the rest and were named National Athletes of the Week on Tuesday by the U.S. Track & Field and Cross Country Coaches Association (USTFCCCA). There is just something about the Clemson Indoor Track & Field Complex that sits right with Grant Holloway. Holloway made his 2019 debut on the same track that he set the collegiate record in the 60 hurdles last year and turned in some other quick times that ended up in the all-time top-10. The finalist for The Bowerman in 2018 doubled up on historic marks in the 60 hurdles this past weekend as he clocked identical times of 7.49. Those marks are equal to the fifth-best clocking in collegiate history. He now owns five of the top-10 marks in collegiate history in the event. Holloway also turned one lap of the track in 20.69 to win the 200 and then a leg of the 4×400 to help Florida win that relay. This is the third time that Holloway has been named National Athlete of the Week during the indoor season. Holloway also took home the honor twice in 2018 (January 23 and February 13). Abike Egbeniyi and Susan Aneno went toe-to-toe this past weekend at the Vanderbilt Invitational and by the end of the 800-meter race, one of them would be the national leader. Egbeniyi surged late and broke the tape first in 2:03.77, narrowly ahead of Aneno’s 2:03.94, which put her on top of the national list after this past weekend. That is the fastest time that Egbeniyi has clocked this early in the season in that event. Later in the meet, Egbeniyi returned to the track for the 4×400 and split 52.3 on the anchor leg. This is the first time that Egbeniyi has been named National Athlete of the Week during the indoor season and the first time that Middle Tennessee State has a National Athlete of the Week during the indoor season as well. Carey McLeod showed out in two events at the UCM Invite this past weekend. The freshman became the first Hornet to go over 25 feet in the indoor long jump as he posted a best mark of 7.65m (25-1¼) to break a 26-year-old school record and win the event. The mark was an automatic qualifier and currently sits as the second best a the NCAA DII level this season. The Jamaican wasn’t done there. He also won the 60 with a 6.82, another provisional mark that ranks No. 8 in DII. McLeod is the first athlete from Emporia State to get selected as a National Athlete of the Week in program history. Monisha Lewis ran the fastest time at the NCAA Division II level this season in the 60 hurdles at the Dr. Martin Luther King Jr. Collegiate Invitational this past weekend. The senior sprinted to an 8.28 in the prelims (converted from 8.26) and followed it with a 8.33 in the finals (converted from 8.31) to take fifth overall at the meet behind only NCAA DI athletes. She also recorded a provisional qualifier in the 60 with a time of 7.62 (converted from 7.60), which tied a program record. Lewis is the first athlete in program history to earn a National Athlete of the Week award. Blaze Murfin wants to make his senior year his best yet. Murfin competed for the second time this indoor season at the Sol Butler Classic this past weekend. He swept both throwing events and established nation-leading marks in each. This is the second time that Murfin has been named National Athlete of the Week during the indoor season. Murfin was also named National Athlete of the Week on December 5, 2017. The last time Erica Oawster threw farther than 49 feet in the shot put, it won her the event title at the WIAC Outdoor Championships. This time, it put her into the national lead and made her National Athlete of the Week. Oawster, who competed at the UW-Eau Claire/UW-Platteville/UW-Stevens Point Tri this past weekend, won the shot put with a heave of 15.11m (49-7). She beat her closest competitor by more than six feet and now owns the national lead by nearly nine inches. This is the first time in her career that Oawster has been named National Athlete of the Week during the indoor season and just the second time in UW-Eau Claire history that an athlete has been bestowed the honor indoors (Alex Mess back in 2016). Wesley Banguria posted one of the best times in the nation in the 5000 across all divisions as he picked up one of the National Athlete of the Week honors. Banguria won the event with a first-place finish at the 2019 Northwest Open with a time of 14:52.83. The mark was the eighth-best time ran in the event across the nation this past week along with being the best recorded in the NJCAA so far this season. Banguria is the first athlete in program history to earn a National Athlete of the Week award. Kristal Liburd opened up her season in a big way with two top performances at the Texas Red Raider Invitational over the weekend. The sophomore placed third overall (second among collegiate athletes) in the long jump with a best of 6.27m (20-7) and took fifth in the triple jump after she posted a best of 12.17m (39-11¼). Both performances were not only NJCAA provisional marks, but both are now the top showing in each event so far this season at the NJCAA level. Liburd is just the third athlete in program history to earn a National Athlete of the Week award for indoors joining Esther Gitahi (once in 2018 and once in 2017) and Kelsey Shannon (2015) as the only Thunderbirds to get selected for the honor.